Happily, it was mostly all very positive feedback from what we also thought was a great show. Of course, much of what makes our show great wouldn’t be possible without significant help. What was perhaps surprising is that the range of older games at the show gained slightly more positive votes than the new machines. I guess it goes to show that there are some real classics from the past that will always be popular. We do our best to source some of these classic titles, though have to acknowledge that it isn’t always possible to please everyone. There were a few people that let us know they would have loved to see Monster Bash or The Simpsons Pinball Party at the show. Sorry they were missing, perhaps next year?! Of course the newer machines had a massive amount of positive votes and comments too, with Wizard of Oz seeming to be the most popular modern machine named in the survey. We always enjoy the special areas at the show, and it seems you share that enjoyment too. The Addams Family Chair proved popular again, re-appearing this year with a few tweaks since we last saw it, and the shrieks of fun could be heard from quite a distance! 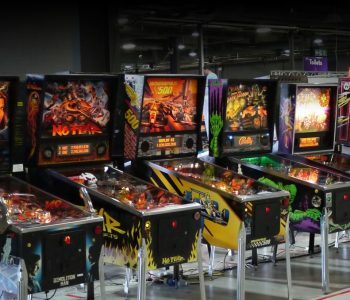 A few respondents thought the selection of pinball parts was great, but would like to see that expanded on at future events. Jim Askey’s ‘MyPinballs’ section had a number of positive comments, as did Tim ‘Strobey’s Live Streaming rig which was broadcasting to Twitch. Most of the negative feedback was unfortunately regarding aspects of the wider Play Expo show which we have little direct control over, but will pass along your comments. Many thought a wider range of refreshment stalls would be welcome, and the queuing system always picks up a few criticisms, but in general it seems to be something that is getting better year on year. Another criticism that we’re well familiar with is people finding it frustrating to see so many pinball machines on four player games (often with only a single player present). This is something we’ve tried to address with signage in the past, but ultimately is down to the audience at our events, who are largely people with little experience in pinball. Frequently we find younger players walking up to a machine and pressing the start button. They see a ball pop in to the shooter lane and start playing. As soon as the ball drains they press start again, thinking that’s how they get another ball (but in reality of course it adds another player). On the flip side (aha) of that though, we have also seen groups of people taking it in turns to play single player games, unaware that multiplayer games can be set-up. So we’re asking you, the knowledgeable pinheads of our community, to help us solve these problems by chatting to people at the events and explaining how this all works. We also put some effort in this year to try and enable ‘slow restart’ on the modern games, which means that holding down the start button will frequently reset games back to single player. It’s going to be a long battle, but we look forward to that day where we don’t see any games abandoned partway through a four player game! We only had a couple of small pinball competitions at this years show. The linked up NBA Fastbreak competition was missing for the first time in our show’s history, and its absence certainly raised a few comments! The competition side is always something that raises interesting feedback, and we’re happy to hear your thoughts. [pullquote]Competition(s) are a nice extra on the side but certainly not the important part[/pullquote] A few commented there should be more/bigger competitions, and equally a few thought they would prefer not to see machines taken away by running those big competitions. The balance from expanding the competitions is something that we’re aware would be difficult to get right, but it remains to be something that we’ll consider in future events. There were plenty of other great ideas that we’ll consider in the future too. More seating areas, and a better way to help people find the machines they love, or explain the history of particular games were amongst some of the ideas we’re now considering.